Z and G Around 300 BC, the Roman Censor Appius Claudius Caecus removed z from the alphabet. His justification was that z had become archaic: the pronunciation of /z/ had become /r/ by a process called rhotacism, rendering the letter z useless. At the same time that z was removed, g was added, but that's another story. Two hundred years later, z was reintroduced to the Latin alphabet but used only in words taken from Greek. But Z lost its place at 7 and was sent to 26 where it remains. Because of its absence and reintroduction, zeta is one of the only two letters to enter the Latin alphabet directly from Greek and not Etruscan. J In the original languages (Latin, Greek, Hebrew) which provide us with the names Jesus, Joseph, Justinian, etc., the sound which we write as J was pronounced as the English letter Y. In Latin, the letter for this was I/i, in Greek it was É/è (iota), and in Hebrew it was è (yod). Thus, the Greek spelling for "Jesus" was pronounced something like "Yeh-SOOS", and the Latin likewise was Iesus. Subsequently, in the Latin alphabet the letter J was developed as a variant of I, and this distinction was later used to distinguish the consonantal "y" sound from the vocalic "i" sound. However, at about the same time there was a sound change in many of the languages of Western Europe, such that the "y" sound changed into a "j" sound. So we have it that in English, the letter J now represents a consonant which is not obviously similar to the vowel "I," despite the fact that they descend from the same letter and the same sound. U, V and W There was the sound for the letter we call U, but it didn't look like U. It looked like V. The Classical Latin alphabet had only 23 letters, not the 26 that we have today. (This is why the W looks like a double V but is pronounced like a double U. For a very long time, U and V were allographs. An allograph is a variation of a letter in another context. Uppercase and lowercase letters are allographs. Before the use of the letter U, the shape V stood for both the vowel U and the consonant V. The letter V used in places were it would be pronounced as a U. The letters begin to look different in the Gothic alphabet in 1386; however the use of the u was not widespread. When scribes did use a u, it was in the middle of words, e.g. save was saue, but upon was vpon. It wasn't until printing standardized letter shapes in the 1600s that the letter U became regularly used. First, in the 1500s, Italian printers started distinguishing between the vowel U and the consonant V. However, the V continued to be used for the U sound at the beginning of words. Y The oldest direct ancestor of English letter Y was the Semitic letter waw, from which also come F, U, V, and W. See F for details. 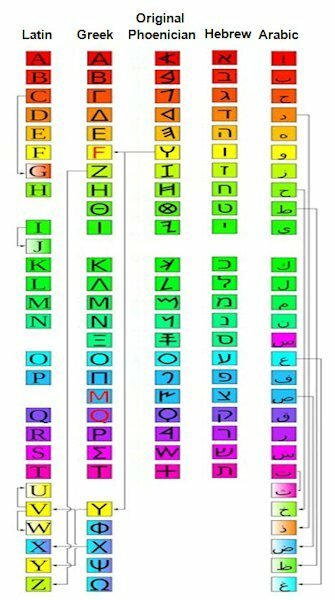 The Greek and Latin alphabets developed from the Phoenician form of this early alphabet. In Modern English, there is also some historical influence from the old English letter yogh (ȝ), which developed from Semitic gimel. The letter Y was originally established as a vowel. In the standard English alphabet, the letter Y is traditionally regarded as a consonant, but a survey of almost any English text will show that Y more commonly functions as a vowel.